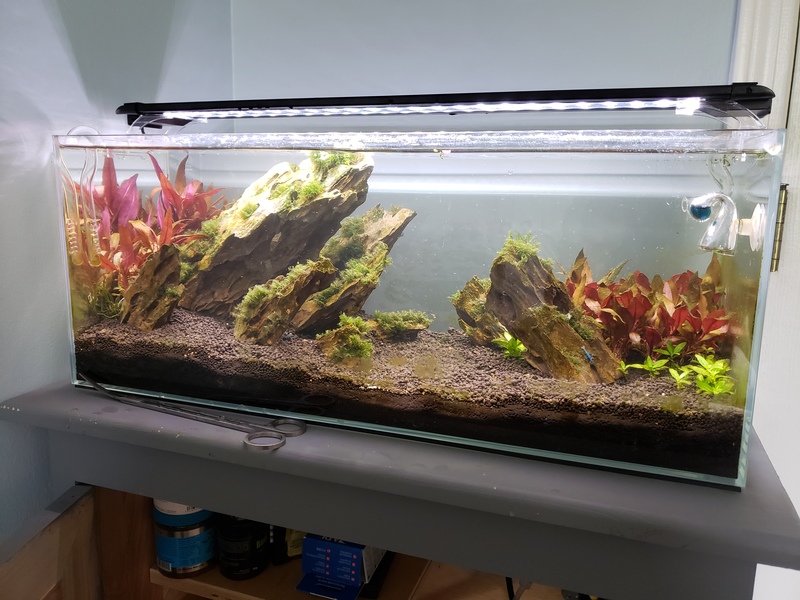 The Planted Tank Forum > Specific Aspects of a Planted Tank > Fertilizers and Water Parameters > Have I made a big dumb? Have I made a big dumb? Let me start this by saying this is only my second attempt at high tech and it's still only using a 9 gal tank. See journal for details. That being said. Have I somehow overlooked my dosing regime so horribly I've basically set myself up for disaster? I am dosing EI, now having read a lot of info I think this may have been a bad idea and I need to dose lean. But anyway. The photo below is from the nilocg website, and I am using the 1ml per gallon instructions. That way I can simply pump in the mixture into any tank by the volume. My concern here is this. I am using RO water for my tanks and remineralising with Salty Shrimp gh/kh. Gains me basically a kh of 1 and gh of 7. Do I have enough calcium in my water column? Macros and micros aren't contributing, so am I deficient? State of the tank isn't great, more like in dismay. New algae types arising each day and plant growth almost non existent. Full run down to help. Approx 7 gal water volume. I have CaSO4.2H2O on hand if that helps. Need some guidance and dosing help I think. Please get your parameters to the above and watch the algae for two weeks. 1 kh with a 9 gallon tank sounds terrifying if you are using co2. Ph is going to crash like crazy, and fast. I would think the Salty Shrimp providing a 7dGH would contain adequate Ca & Mg. Most likely a 3 or 4:1 ratio. CaSO4 (gypsum) is not very soluble and would be hard to dissolve. Alkalinity/dKH of 1 is not hurting anything, should be enough buffer for any CO2 you are injecting. Can you explain any more details about algae etc??? Don't think this is a Ca issue. How are you measuring the potential 30ppm of CO2? @Ddrizzle I will be getting my parameters close to that I hope. Actual measurements are hard as I'm not able to test for ca etc. @Maryland Guppy measuring co2 via drop checker. Ph isnt crashing so I think my kh is okay as well. Algae pictured below. Apologies for the pic, hard to photo this stuff. It's the stringy brown attached to the moss. I also have staghorn, and now cyanobacteria is appear. Plus algae on the glass. Attempted to find what the ca:mg of salty shrimp is, unfruitful thus far. I'm not able to test for ca etc. measuring co2 via drop checker. Ph isnt crashing so I think my kh is okay as well. API test kit can be used for Ca in freshwater. Many target a 1.0pH drop from de-gassed water to 1st hour of photo-period. Never seen actual contents of Salty Shrimp or it posted. I will get myself a ca test kit. See what comes of it. As far as the ph drop. Will confirm tomorrow. Last time I checked I went from 6.8 to 6.0, felt like going much further was a tad extreme. I cannot actually find what is in SS, they talk about the importance of trace elements and a whole heap of its benefits... but no list of its contents. Once I get the ca test kit I will test a bucket of water and drive from that and gh how much the ca:mg ratio is I suppose. For your testing priorities, it should go nitrate, phosphate and potassium. From there iron, calcium and magnesium. So get your nitrate and phosphate to 20ppm and 5ppm asap. They should read this every day. My bet is one of these being your issue, likely phosphate. Potassium cant be measured easily as far as I know but potassium nitrate and mono potassium phosphate already include the right amount of potassium when used together. Your calcium and magnesium is likely ok due to you salty shrimp. Those aren't as big of a deal though, especially the ratios. You just want to make sure you have some period, which is often a issue with RO water. Magnesium deficiency is lighter leaves, not usually yellowing and holes/necrosis. Finally, make sure you are dosing iron and micros, or a mix that includes both like plantex csm+b. Big Dragonstone(blocking flow? ), looks like a lot of hardscape, not much plant mass. Potentially poor CO2 flow. You don't need full EI dosing not even close, but your bigger problem is still too much light and possibly not enough or poor flow CO2 look at flow patterns and try to get at least 1 ph drop(watch livestock). Reduce light intensity and/or photoperiod by another 20%, Clean filter, scrub off algae on hardscape, walls, plants, remove algae covered leaves. Vacuum and blow the subtrate to remove dead leaves and detritus. Target 1/3 EI dosing until you have much more plant mass (probably won't need to increase ever with all that stone). Watch to see if Algae subsides and look at plant health and report back after 1 - 2 weeks. I am not sure in a 9 gallon you are going to ever get stability with all that stone it won't be easy. This is not a good setup for shrimp as its not stable yet and hard to fight algae and keep those shrimp happy large water changes may not be good for them. I wont do a double quote as it will be huge, but you both make some good points. I honestly cant believe I have a deficiency in my ferts at any point, like cl3537 says it's most likely bad flow and co2. My primary concern was calcium due to salty shrimp, but I think everything else will be good. So my next steps are going to be somewhat difficult I suppose. I have to try and get this tank meticulous, whilst having these shrimp. I dont think it can be done if I'm entirely honest. I have been doing the 50 percent water changes weekly and keeping up with the filter. However, haven't done anything like vacuuming as it would simply uproot all my carpet. While I know that this hardscape may be causing some issues, I cannot believe that I would be able to have it like this an be successful. There must be some way right? My second tank is currently cycling, once it finishes then I can use it as a shrimp tank until i get this one stable. My ultimate goal is to build a colony, not just have them slowly dwindle away. Today will be a lot of work on the tank, I hope I can get this under control. Bumping the lights down another 20 percent seems terrifying, I know algae will take a hit, but my plants are already suffering enough. Tough road to success I suppose. Will report my progress here and on my journal. I honestly cant believe I have a deficiency in my ferts at any point, like cl3537 says it's most likely bad flow and co2. My primary concern was calcium due to salty shrimp, but I think everything else will be good. Moving the shrimp until you grow in the tank may be the best solution, you can increase CO2 and not have to worry about deaths. Blow the carpet with a turkey baster and then vacuum above it at the same time. Don't vacuum the carpet directly until it is firmly rooted and established and even then depends on the power of your vacuum. With enough healthy plant mass algae will be reduced, the challenge is getting there. While getting there reducing light is your best defense of algae. Plants won't die with shorter photoperiods(assuming you have too strong light which appears to be the case) they just don't grow as fast. Reduce the photoperiod to no more than 6 hours, you might want to get a manual power timer if the light only moves in 3 hour blocks. Best of luck, hope things turn around. I may be having a similar problem to you and I am considering removing large pieces of my hardscape. I was looking for a small powerhead which would help with flow problems, I couldn't find one weak enough for a 9 gallon (not even for my 17g) but that is something worth considering. I have a 60 gph I got on Amazon and with a sponge it is a bit weak in my 20. For $6 this is worth a shot OP. This should help with flow, you still may have to crank up your CO2 a little. @cl3537 well...I have either signed my ta ks death warrant. Or this will bring new life into it. I didnt plan on doing this, but I always hated the way I planted the carpet. I didnt do single strands, but sections. So now with worse and weaker plants. I will try it the correct way and see how it goes. I expect I have also condemned my shrimp. They have been dying one by one as is, so this is to hopefully help not hinder or hurt them. Time will tell. I keep posting as this progresses today. The problem here, its my problem as well at the moment, is you have very little mass of plants in your tank now. You shouldn't be focussed on removing all algae, you need to worry about growing more healthy plant mass. If you planted heavy, fast growing, big leaf plants, you will be able to get a more stable tank and then in future less algae. As it stands now you now for sure need to lower your light, probably only a 3 hour photoperiod and seriously considering getting some more fast growing plants in there when you can. Your tank is practically starting over in terms of plants mass and its in a fragile state. I would put both inflow and outflow in front of the biggest rock at least you will have good circulation for most of the tank except possibly that back left corner where you may need a powerhead to reach. Agreed, I dont have the greatest amount of plants, and I should have known that I was making a mistake in my methods. Sadly though, mistake made. You're probably right, lower light and better circulation. I'll cut down to a third dosing as well. As far as moving the intake and output, I may struggle. Lacking the hose right now. I'll see what I can do though. State as of right now. 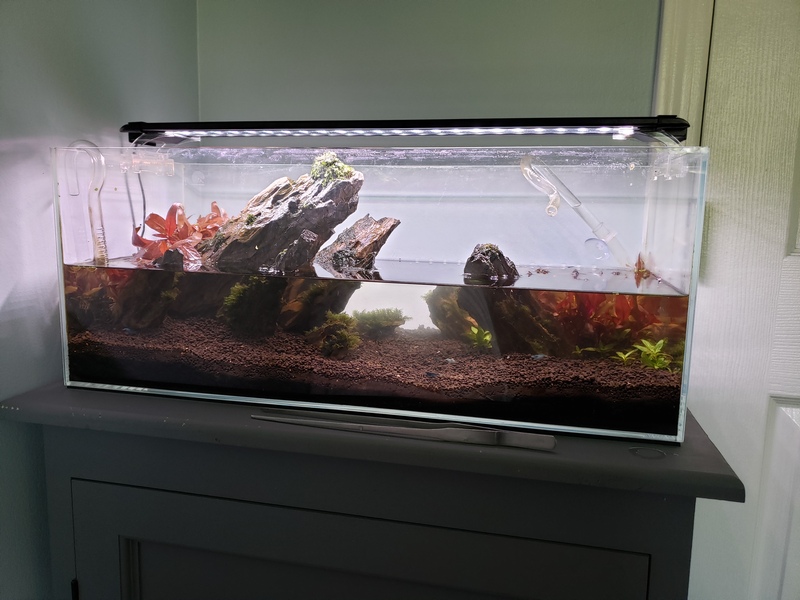 Tank drained after algae and soil was cleaned. I tried to get as much as possible but if I do too much of a water change the shrimp will suffer further. Scrubbed walls and leaves. Now time to replant as I refill tank. 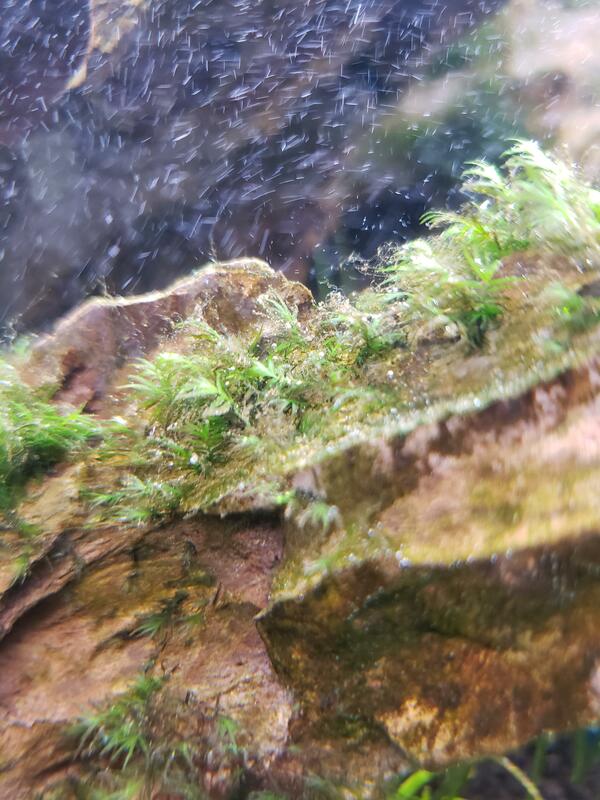 Shrimp acting manic, low o2 I believe. I'll buy that power head as well. Place it back right corner and complete the circular flow.